Formative evaluation is really just a fancy word for testing. It doesn’t have to be a complicated scientific experiment. When it comes to resources, formative evaluation can be as simple as handing it over to some colleagues or friends and asking them to have a go. It’s amazing what a fresh pair of eyes will notice. Sometimes you think it is the clearest, most obvious thing in the world, but to someone else it just doesn’t make sense. Even if you have been creating the same types of resources for years, even if you think you know your organisation and your visitors like the back of your hand, stepping back and openly reviewing what you are developing will help to make it even better. So I was tasked with testing out some of our new family activity sheets. 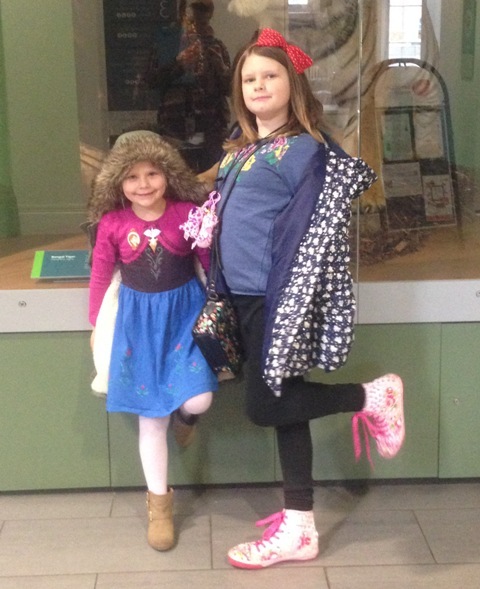 I decided that my nieces Chloe (aged 5) and Ruby (aged 9) would be the ideal candidates for the job, and not-surprisingly my sister was pretty happy to let me borrow them for a day. Chloe does not understand the concepts ‘slowly’ or ‘quietly’, she is a bundle of non-stop energy. In contrast Ruby is at that age where it is categorically not cool to find anything cool, she is not easily impressed. They haven’t been to many museums or heritage attractions. I have tried, but no visit has ever lasted longer than about an hour, which usually includes about 15 minutes in the shop. I decided to take them somewhere neither had ever been and typically wouldn’t want to go: Leeds City Museum. On the way there I asked what they thought it would be like at the museum, the answer a resounding: boring. Chloe said she would have to be quiet and not touch anything and Ruby was adamant that all stuff in museums was just old and dusty. I realised the challenge I had set myself! But then it is best to test with a tough audience, if it works for the hardest to reach, it will be sure to work for the rest. We arrived at Leeds City Museum and decided the best place to start was the café. We had a drink, I attempted to butter them up with the kind of stupidly sugary foods only cool aunties will let you have before lunch. I explained to them that we were trying out the different activities for my work, but didn’t tell them much more. If I used the word ‘testing’ it would feel too much like a chore, or they would behave differently. When testing you want to try and not influence the participants behaviour. 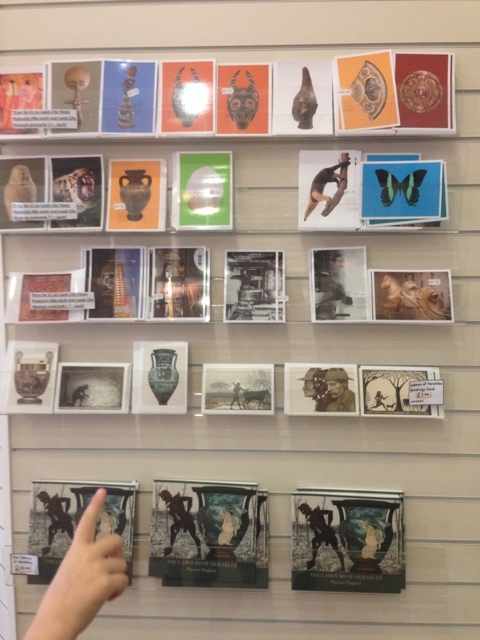 The resource I was most keen to test was our ‘Super fun things to do in museums’. 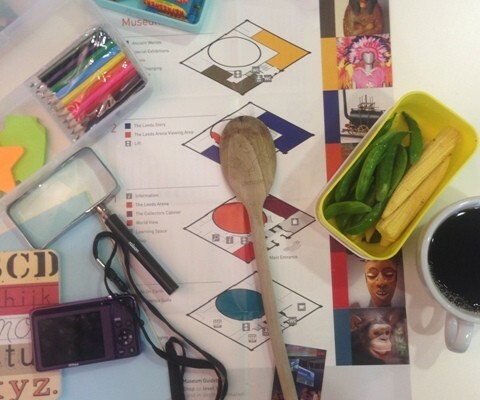 Back at Heritage Insider HQ we had carefully developed ‘Super Fun things to do in museums’ as a resource to help make museum visiting more memorable and enjoyable for kids, without sacrificing learning outcomes. All of the suggested activities are fun, but encourage children to look at, talk about, think about, or engage with the objects on display. 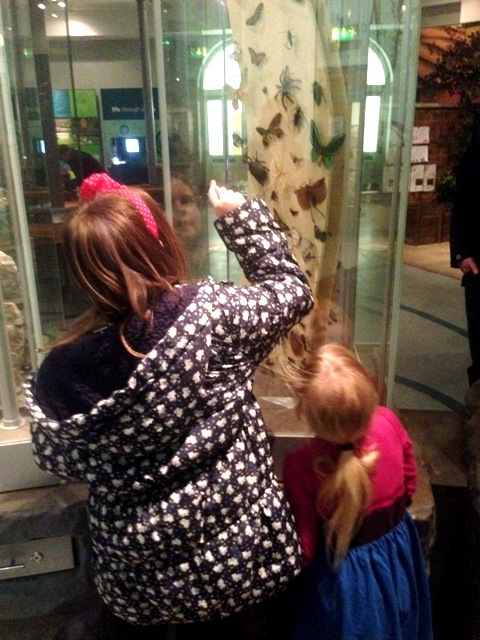 First stop for us at Leeds City Museum: the Life on Earth Gallery. Immediately Ruby and Chloe head to every flashing light, button and screen in sight. I attempt to hurdle them up to look at a case of animals, but failed. Using the various interactives wasn’t part of the days agenda, but I decided it was best to let them have five minutes playing with various things that flash and make noise. No reason it shouldn’t be fun for them. If I had forced them to stop and do what I was asking, then it would have been immediately greeted with negative enthusiasm. By chance Chloe catches sight of a stuffed duck billed platypus and burst out laughing: ‘what is that?’ Ideal, she is hooked in to something, so let’s open with one of my favourite super fun things to do ideas, we will play Tour Guides. To play Tour Guides you have to find something in a case which you don’t know what it is. Then one person pretends to be a tour guide and has to make up things about the object. You then read the label and find out what it really is. Seems simple, so Chloe is picked as our tour guide. I tell her to make some things up about what she thinks the funny creature is and where it lives. She freezes and looks awkwardly at the platypus, then at me, then at Ruby, then at the other kids around her who aren’t listening but she is obviously conscious of. Ruby tries to help her by saying some things she had already read. Not the point, and not super fun. I am a bit disheartened, as I was sure that activity would be one of the favourites. I am tempted to push it a little longer as I am so sure it will work, but decide it would be unfair to push my judgement. It wasn’t working, so move on. We come across a case full of butterflies and both girls linger for a few seconds- another opportunity. Another of the suggested super fun things to do in museums, is to pick a colour each, then looking at just one case, find as many objects as you can of that colour. This case of butterflies was ideal to try that. Chloe chooses pink (predictable) Ruby picks blue and I am told I have black. We then look carefully through the case at all the butterflies, excitedly counting out when we find one in our colour. We get our totals, Ruby wins (even though we never called it a competition) but then we spend a little more time looking one by one at the different colours. First we look at all the blue butterflies and compare them, then we talk about the pink ones and dispute between red and pink. Then we look at the black ones and talk about how they look more like moths or creepy bugs and then we discuss the difference in moths and butterflies. In total we spent about 12 minutes at that one case of butterflies. Just unheard of really, both as a standard dwell time for an exhibition case and as length of time anyone has ever had Chloe standing in one place. An unexpected victory. Which is an important part of testing: allowing yourself to be surprised. I hadn’t expected much of that idea, but it worked really well, much better than anticipated. We try a few more ideas in this gallery, including talking about which animal out of each case we would keep as a pet and why. Interestingly they both want a polar bear: Chloe because it will keep her warm, Ruby because it will eat Chloe. In total we spent almost an hour in that one exhibition and I hadn’t heard a single moan. We are already doing considerably better than any previous efforts at museum visiting. Ruby suggests one of the super cool things that she liked the sound of and not surprisingly it involves going to the shop. 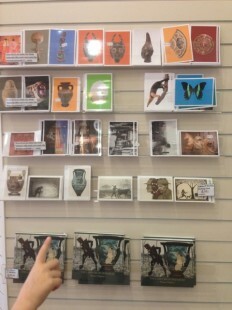 The idea is to go to the shop first, buy postcards of things from the collection, then you have to go find them. When you do find them you can write or draw on the back of the postcard. I hadn’t considered it before, but it quickly dawned on me: what if these are not on display? I check and it was fortunate I did, as two of them were from a temporary exhibition that had just closed. We switch them for things definitely on display and I make note to add that to the instructions on the final resource. Another important part of evaluation: look out for the unexpected. Ruby picked a postcard with a mosaic of a cat on the front, she wasn’t aware it was a mosaic, she just liked the ‘laughing cat’ and was pretty keen to find out what it was smiling about. 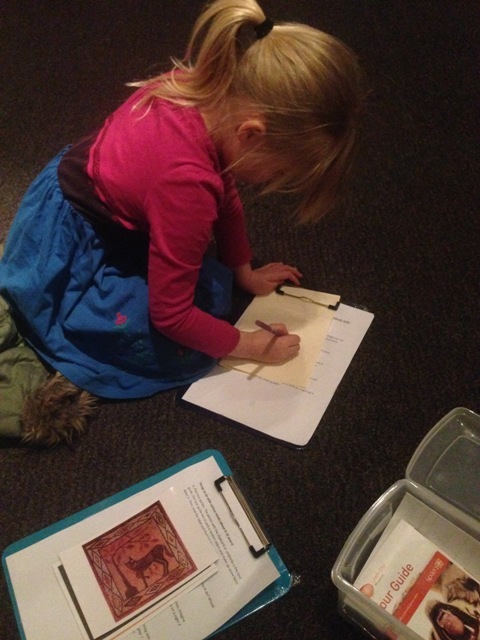 We quickly found the laughing cat in the Ancient Worlds gallery and to my surprise they both dive in to the survival tool kit for pencils so they can draw it. 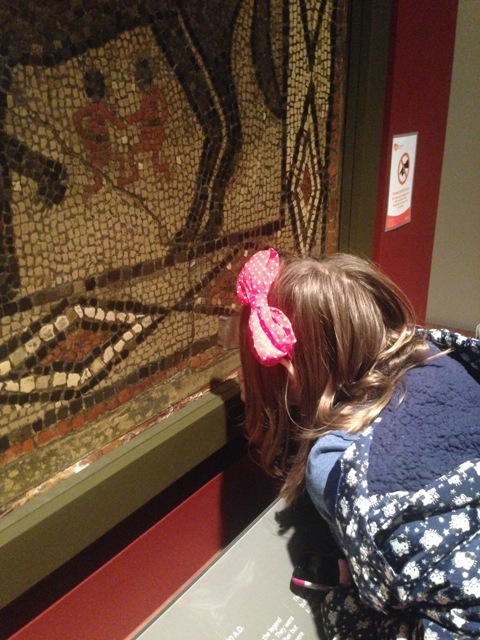 Whilst they draw I ask them what they think it is made from and manage to sly in some subtle learning about mosaics which I had quickly gleaned from the label whilst they are engaged in drawing. Again we spend about 15 minutes looking at this one object. Ruby asks if we can try making some mosaics at home and we talk about different materials we could use. This gives me an idea for another activity sheet I have been working on. A few of our suggested ideas of super fun things to do in museums were less successful. Some were less fun than anticipated, too complicated to explain, or set at the wrong level. One suggestion was to look for objects with hidden super powers and decide if they would be used for good or evil. In planning, we anticipated this activity being suited to older children age about 7-10 years. In the testing it was Chloe aged just 5 who loved that activity and came up with some amazing crazy ideas (look out for the mystery moo jug that pours your favourite milkshake). 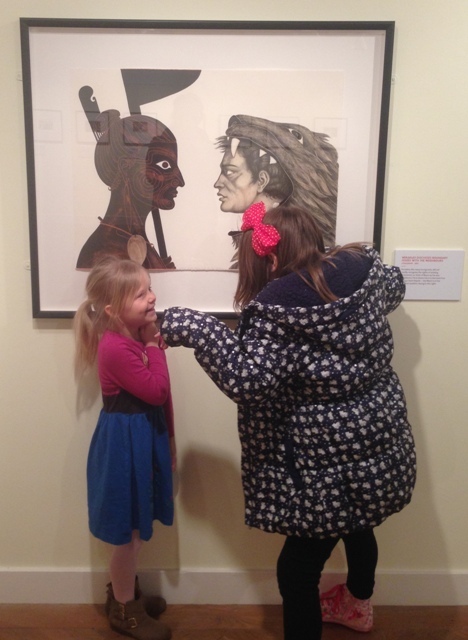 Despite our extensive experience working with children in museums, as a team we are still often surprised and happy to be proven wrong. No matter how qualified, or how well experienced you are, you should never be ashamed to admit you were completely wrong. I couldn’t however let go of my idea of the tour guides game. We found a quieter part of a gallery and sat to have a drink. Ruby dug out the wooden spoon from the survival tool kit and starts using it like a microphone to sing. Bingo! That is what a tour guide needs, a microphone! So I suggest the game again but using the wooden spoon as a microphone. Ruby is quick to jump up. She comes up with some fabulously funny story about a jug used by Caesar himself, not the right era of history for the object, but still creative, and she did read the label afterwards. Another important part of testing is not to write something off straight away, sometimes it needs a second try from a different angle. There are now arguments over who gets the wooden spoon and I have to think fast of a new way to use it before it becomes a weapon. We enter a temporary exhibition which is mostly a collection of paintings. I suggest we copy scenes from the paintings but use the wooden spoon to replace items from the picture. They love it! We get some funny looks from other visitors when I have to become a horse to the brave Chloe with her wooden spoon sword, but this is too much fun to care. I realised that this would be perfect for super fun things to do in art galleries. It is at this point I realise we should rename the resource ‘super fun things to do in museums (with or without children)’. Because I know plenty of adults who would have lots of fun doing similar things on the sly. We spent almost 3 hours exploring the galleries at Leeds City Museum and didn’t even realise we had almost missed lunch. I treat my volunteers to a lunch I knew their mother wouldn’t approve of whilst making notes on what had worked and what hadn’t. I ask Ruby and Chloe what they enjoyed most. Acting out art with the wooden spoon seemed to be a clear highlight. 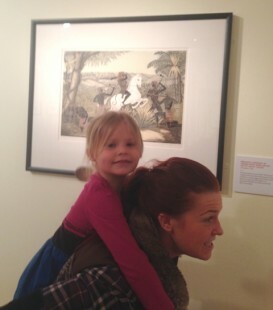 Chloe proclaims she has never been to an art gallery, but wants to as it seems like fun, Ruby agrees. Well just by chance Leeds City Art Gallery is round the corner and just by chance I have Art Gallery bingo which I am wanting to test. I am pretty much floored in disbelief when I ask if they fancy going to Leeds City Art Gallery after lunch and I am greeted with two very enthusiastic yes’s! Get your copy of the finished resources Super Fun Things to Do in Museums (with or without kids) and Art Gallery Bingo. And keep your eyes out for our newest idea: amazing things to do with a wooden spoon. See all the pics from our day testing resources at Leeds City Museum and Leeds Art Gallery in our flick gallery. 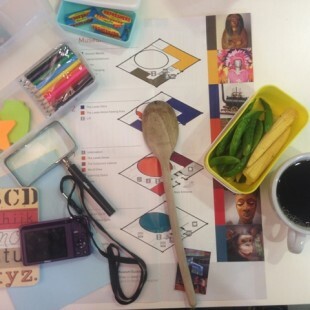 If you are looking for help or support to develop or test new resources, then get in touch, we would love to help.